If you have a teenager, you have probably heard of the Netflix television series 13 Reasons Why. Based on a book of the same name, this hit show chronicles the mystery surrounding the suicide of a teenager named Hannah. The narrative structure of the story plays out through thirteen audiocassettes that she left behind, each detailing a different person whose acts or omissions were responsible for her decision. The story unravels in an increasingly bleak manner and touches on themes of underage drinking, teenage friendships and relationships, social media, bullying, isolation, sexual assault, and suicide. Understandably, many parents and school districts have raised concerns and complaints about the series. Common amongst these are that the show glamorizes suicide, and that it may influence other teenagers to follow Hannah’s lead. Even if you forbid your children from watching the show, that does not mean they will listen. They can still figure out how to watch it while unsupervised, at school, at a friend’s house, or while at their other parent’s place. Or they can read the book. Assume that they will watch the show or want to know about the show. Be available to watch it with them or to process each episode with them. Ignoring the show’s existence or the concept of teen suicide will not make it go away. Teenage suicide is a very real and statistically high cause of teen deaths. The teenaged protagonists in the show had caring, present parents who would consistently ask how their teens were doing. However, these kids hardly ever confided in their parents until it was too late. It is important to remember that as children become teenagers, their life experience amongst their peers, on social media, and at school changes dramatically. While teenagers often become more reluctant to communicate or share as they age, it is important to adapt your methods of communicating and connecting with them. Keep trying and do not give up, even if they yell at you. Don’t forget that you were once their age, and that sharing your struggles, mistakes, and fears with them may help you become more relatable to your teenagers. Look out for warning signs. Notice your children. Be mindful of changes in behavior, such as acting out, becoming withdrawn, extreme mood shifts, entirely new friend groups, and dramatic changes in their appearance. Do not ignore these changes and hope they resolve themselves. 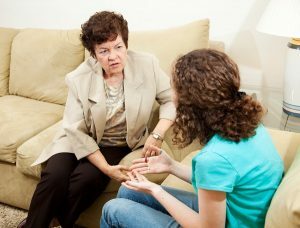 If you cannot get through to your child, consider outside help, like a therapist. New Direction Family Law has over twenty years of experience handling separations, divorces, and child custody matters. Our legal team understands how difficult divorces and custody battles are on every member of the family. We take pride in passionately advocating for our clients’ interests and remaining a voice of reason in times of crises. Our office serves Wake, Johnston, Lee, Harnett, Cumberland, Nash, Granville, Franklin, and Durham counties. Call New Direction Family Law at (919) 719-3470 to schedule an initial appointment, or contact us at our website.